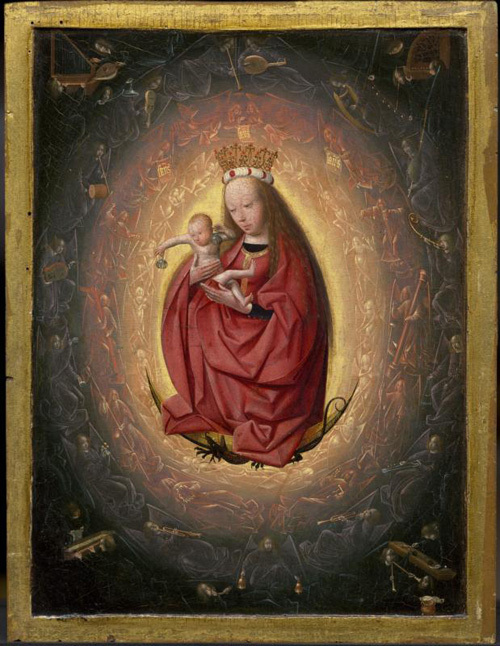 BALTIMORE (CNS) — A 500-year-old oil painting of “The Glorification of the Virgin” now on display at the Walters Art Museum in Baltimore is a genuine feast for the senses. Inspired by John’s apocalyptic vision of a woman “clothed with the sun,” the image shows a crowned Mary surrounded by an intense radiant glow. Standing atop a black dragon whose eyes are set on the infant Jesus resting in her arms, the woman maintains a tranquil expression with downcast eyes. A viewer can almost hear a symphony of sound bellowing from an orchestra of angels playing horns, pipes, bells, a clavichord, a dulcimer, drums, flutes, harps and all kinds of other stringed instruments. Even the baby Jesus holds two jingle bells. The free exhibition is at the Walters Art Museum from Oct. 16 through Jan. 8. It was organized by the Walters in partnership with the John and Mable Ringling Museum of Art in Sarasota, Florida, where it will be on display Feb. 4 through April 20. “The idea of the late medieval period is that the sense of engagement of the body would allow you to trigger your spiritual senses so that you feel a communion with God while you are still on earth,” explained Martina Bagnoli, exhibition curator and the former Walters’ curator of medieval art who now serves as executive director of the Gallerie Estense in Modena, Italy. Many of the works on display were used in Catholic liturgy and devotion. They include reliquaries, prayer books, rosaries and monstrances. “Bells were important because it’s through the sound of bells that people could really let the doctrine sink into their soul,” said Bagnoli, noting that some of the bells at the exhibition were once sounded during Mass at the moment of consecration or to call people to worship. Large bells were often made in foundries inside churches, she added. The idea that one could “imbue the faith through your ear,” Bagnoli said, also is represented in exhibition depictions of the Annunciation, when the angel Gabriel announced to Mary that she would bear the Savior. An illuminated page in a 14th-century French prayer book, for example, shows the Holy Spirit entering Mary through her ear. A gold reliquary made by a Bohemian craftsman that dates to the mid-1300s also is featured in the exhibition. 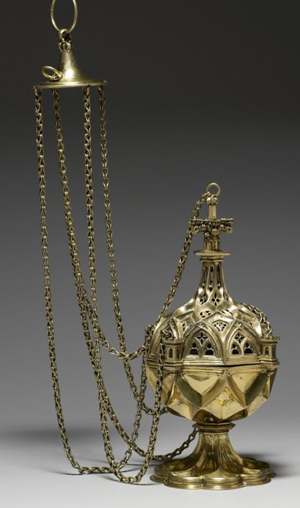 It once held what was believed to be a thorn from Christ’s crown of thorns, situated between two kneeling angels. “When you see the piece of wood, you are supposed to imagine the whole passion of Christ and the resurrection of Christ,” Bagnoli said. Late medieval Europe was a time of increased secularization of society and humanization of religion, the curator said. Engagement of the senses during religious devotion included such practices as scenting rosary beads, she said, and repeating prayers to incite a “sweet taste” in the mouth that would serve as a divine communion. The use of sweet-smelling incense at Mass showed the prayers of the faithful literally billowing up to God. The exhibition, which includes the sounds of bells, chirping birds and selected period music piped in to enhance a viewer’s experience of various works, also highlights secular art. It includes magnificent tapestries and courtly items such as ivory combs, cups, spoons and mirror cases.